In the fifty-five years since his death Django Reinhardt has remained the inspirational and stylistic beacon for generations of followers who believe that Reinhardt, despite the passages of jazz fashion, remains the greatest guitarist of all. Consequently they form what might be termed a sort of European salon, a gypsy tribe of disciples who preach that Reinhardt musical gospel with undiminished passion. So it is with Django’s Castle – one of the most devoted and super-skilled Reinhardt tribute ensembles – formed in 1984 by guitarist Pere Soto. 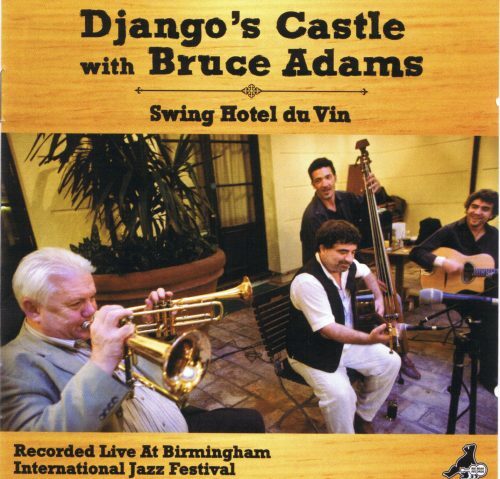 It was at Hotel du Vin during the 24th Birmingham Jazz Festival that they were introduced to the phenomenal trumpeter Bruce Adams. Bruce is himself a living celebration to a rapidly-disappearing jazz genre: the art of swing. On the face of it the musical combination might seem an unlikely one; a Django-esque ensemble teamed with a swing trumpeter. But of course there are distinguished exceptions. From its opening bars – where, following Soto’s crisp introduction, Adams launches a lightning cup-mute attack on Limehouse Blues – the joys fall thick and fast. Both men are master soloists, with plenty of space to parade their skills in this beautifully recorded set, and Soto’s audacious, ebulliently humorous and frequently quotatious guitar regularly engages in conversation with Adam’s horn on equal terms.